Thanks to Karin Dahlin Kretz for the lagoon action pics! Making Phan Rang a stop on my South East Asian trip was a given. I’d read some very promising stuff about this spot but it still seemed to fly below the radar of the masses, making it a bit of a hidden gem. 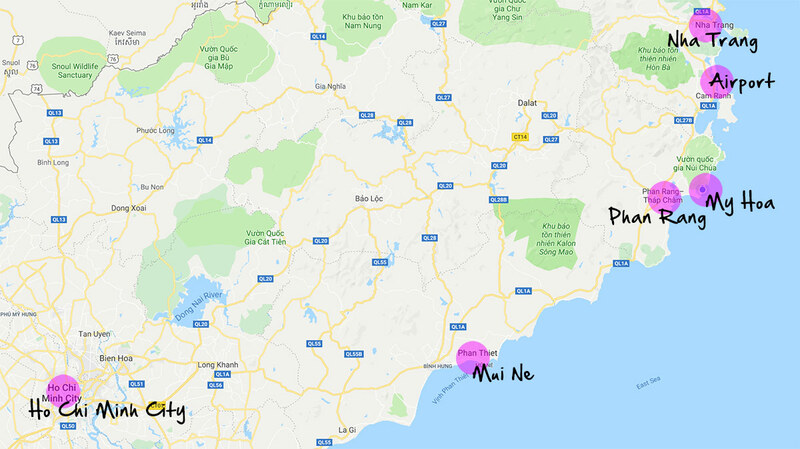 When all newbies still made their way to Mui Ne, people in the know went just a few hours more North, to My Hoa, Phan Rang. 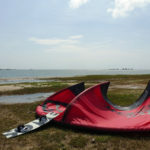 Here you find a massive flat water lagoon with waves outside, and even stronger wind than Mui Ne. All to a beautiful backdop of barren, rocky mountains. It’s easy to get blinded by the greatness of this place. Morning bliss at My Hoa lagoon. Phan Rang is only one hour drive from Nha Trang/Cam Rahn international airport. There are trains and buses from Nha Trang, but since you have to go 40 min the opposite direction to get there, the best option is to take a taxi straight to Phan Rang. It costed 800,000 Dong straight to the My Hoa lagoon. There are also buses from Mui Ne to Phan Rang, as well as possibility to arrive by bus or train from Ho Chi Min city. 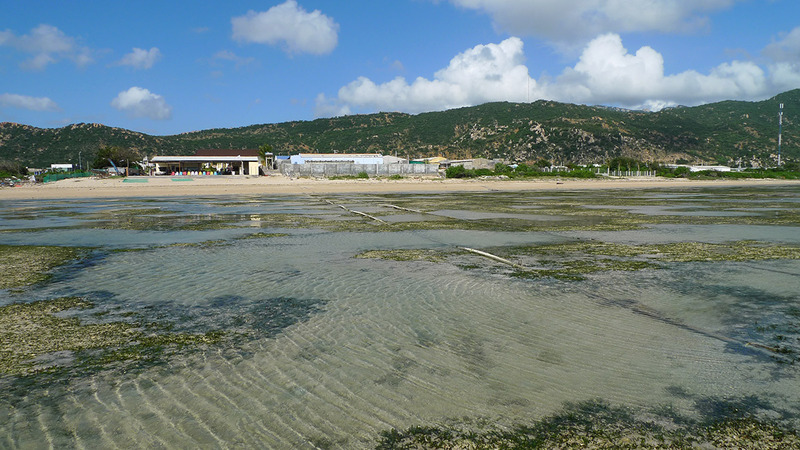 If you arrive in Phan Rang, and don’t have your own bike or car, the only way of getting to the lagoon is by taxi which takes about 25 minutes and costs around 300,000 Dong. Bus, train or plane. Many ways of getting to Phan Rang. One thing is for sure. 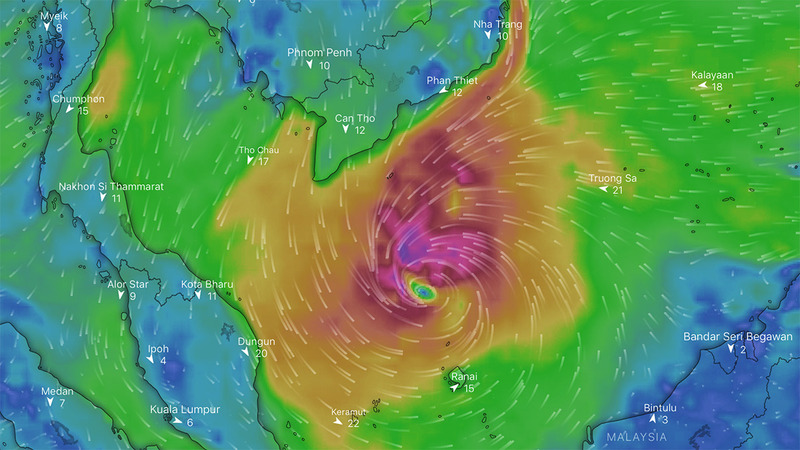 Phan Rang is windy! I’ve been to few spots with this consistent wind outside of Brazil, where the wind greets you in the morning and still keeps going when you go to bed. Bring small kites in the 6 – 10m range. From December to March/April a NE side to cross-shore wind delivers wind almost every day. During my stay it was also cloudy the first week and the wind would sometimes hit the 30 – 40 knots mark and be rather gusty. With no sun and strong wind it can be pretty cold in the evenings and also when out riding, so bring both jumpers and some neoprene. A 3/2 shorty should be enough for most of us. One reason of this cloudy weather with strong wind has its roots in a typhoon that was passing South of us around New Year’s. 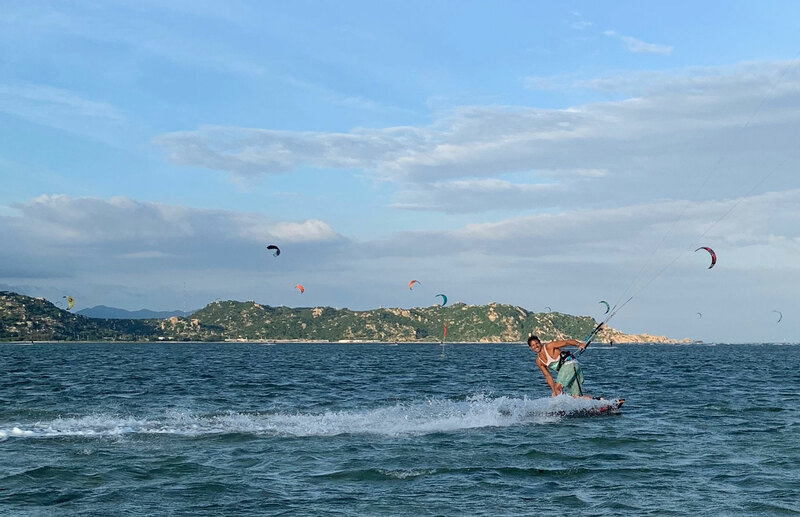 After it had passed there were a few days with light wind and then things went back to normal, with sunny skies and wind around 20 – 30 knots. The typhoon messed up the weather a bit. Clouds and rain didn’t stop the wind from blowing. …but most days were warm and sunny. 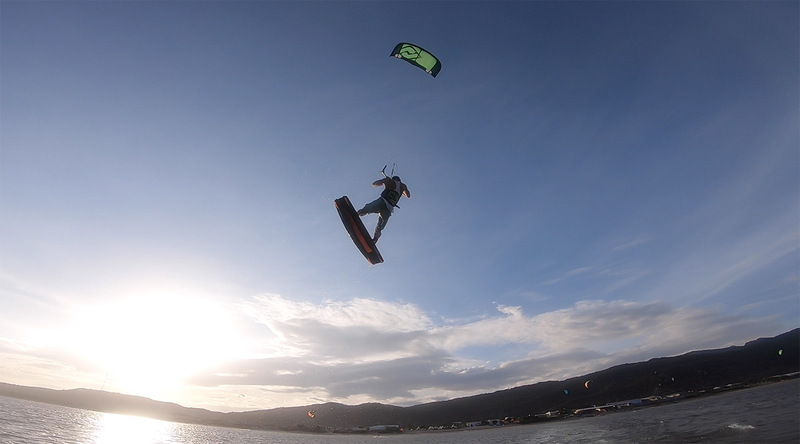 There are other spots in and around town, but during the Winter months when the wind is coming from NE the lagoon is the hands down go-to spot. In the summer months it actually dries out and then you can only ride in the waves outside the reef (plus the wind is way less consistent). My Hoa lagoon runs along a few km of developed and undeveloped coastline and is about 500 – 800m wide. The beach is big enough to prepare your kite but when tide is high you have to walk out a bit in the water to launch. 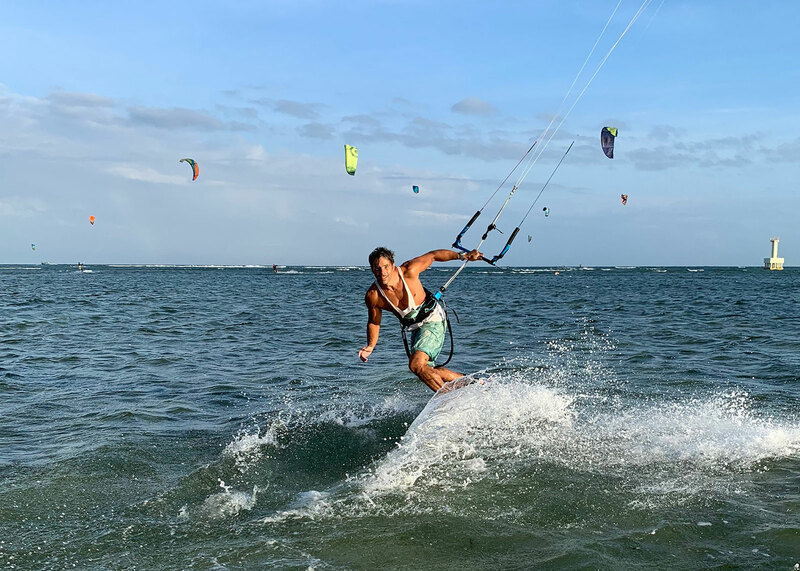 The wind is side to cross-shore so everyone is riding perpendicular to the reef which means that there’s plenty of space for everyone and no sweet spot to fight about. This will see a lot of development in the next few years. It’s too good not to. The lagoon is tide dependant and normally empties at low tide. I say normally, because in my first week the big swell outside the reef was pushing in enough water for the lagoon to always be rideable. If you’re not precious about your board you can go out as soon as the water is ankle deep and covers the lagoon. Even in high tide the lagoon is shallow and knee deep everywhere. You can access the lagoon by just rocking up on the beach (finding an entry point might be a bit tricky) or through one of the centres. This costs 100,000 Dong/$5 a day or 500,000 Dong/$25 a week and you get access, storage, assisted launch, showers, WiFi etc. The lagoon in low tide. Taking a break from the action in My Hoa lagoon. Photo shoot in the lagoon! There are four centers available in 2019. Here you’ll find a mix of globetrotters from all around the world, mixed with big groups of Chinese and Koreans. English is used as the common language, but of course if you speak Vietnamese you’ll take your visit to the next level. This is the original centre. 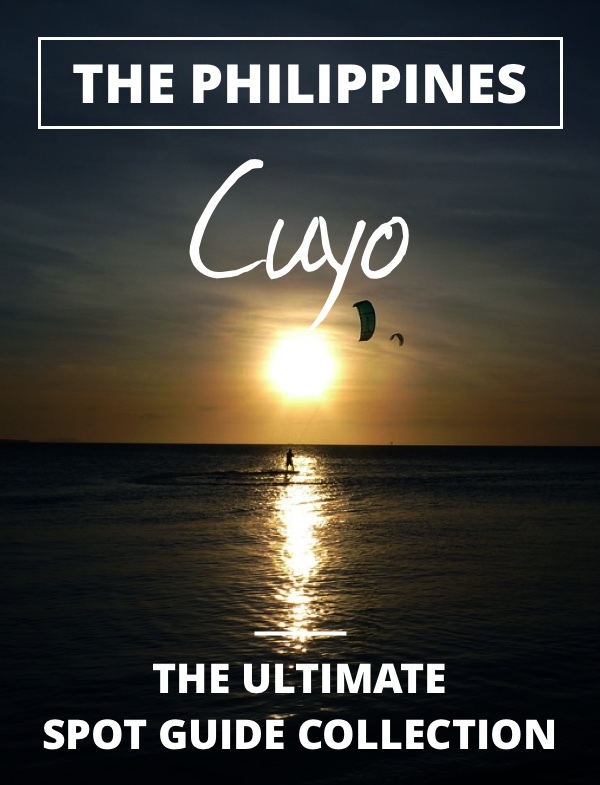 Phi started the whole My Hoa lagoon movement in 2015 and in recent years more and more centres are popping up as they see the potential, and the increase in tourists. It’s a cozy centre sheltered by trees and bushes and the vibe is more make-shift than Son’s place. They’ve got a bar and restaurant at the centre as well as basic accommodation. Phi’s place is the only one with a kite repair shop. I had to use it once to fix a rip in the canopy. A fairly easy fix but I suppose monopoly drives the prices up so I had to pay 60$ for a bit of stitching, not even panel replacement. The tip here is to give your damaged kite to Son and he can hand it in with his school kites for a local price. Son’s place is only a few years old. He used to work for Phi but eventually started his own centre. I picked this place simply because the dorm accommodation looked nice, but it turns out this is probably the best centre to stay at in many regards. 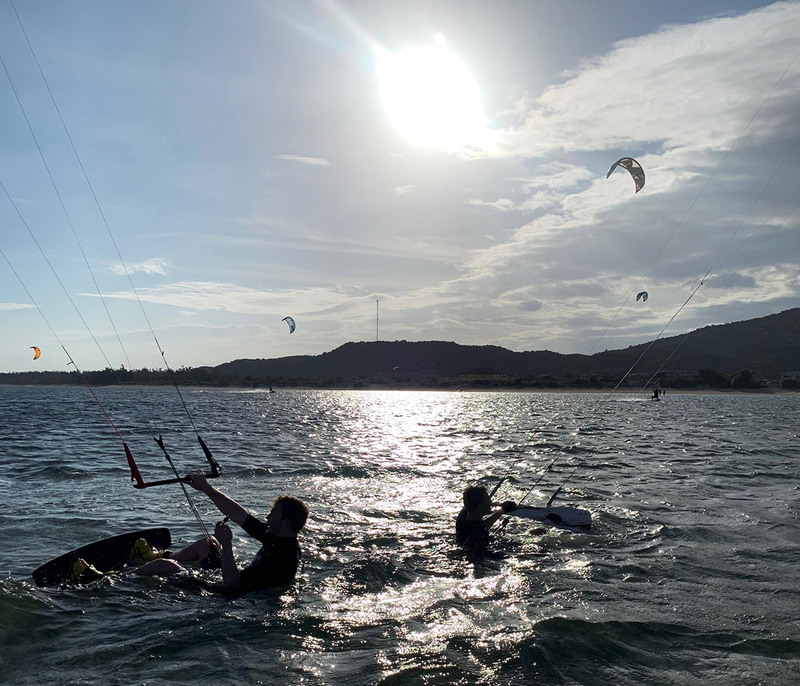 The beach boys are always there to launch and land you and the layout of the centre is very open so it’s perfect for watching a panoramic view of the lagoon and the other riders while enjoying your lunch. They’ve even got an incline barrel slider if you want to hone your park riding. The locals rode it hooked in and with straps and fins. Anything goes as long as you’re having fun! There’s no bar but the restaurant serve beer and food at good prices and quick service. For the best value food however, head across the street to Hoàng Sáng guesthouse. Super cheap, super tasty and super friendly. The spring rolls are hand made and the banana milkshake with added Cream-O’s is to die for. This is also a good option for long term accommodation. Son’s place where I stayed for almost three weeks. The place is brand new but has the least water and also a bit less strong wind as it’s the one closest to the mountain. It’s more of a resort feel to the place and maybe better suited for families. It’s a good place to come for dinner though as the food is the best among the four centres. Prices are a little bit higher and the food takes a long time to prepare but the quality makes up for it. Sorrento Beach Club got the food going for it. This is the most basic centre. Here you can live in a tent right in front of the lagoon. 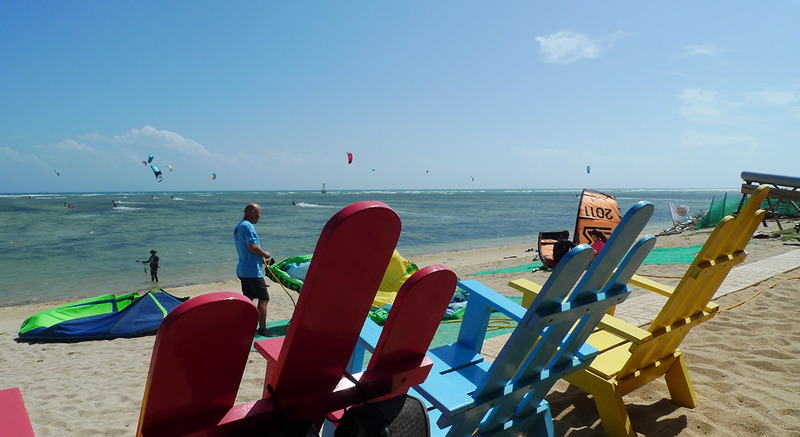 There is also a decent restaurant and storage available, but it’s more of a windsurf place. I assume that they will expand their offering in the upcoming years as the spot grows. Stay in a tent for 15$ a night at Vietnam surf camp. So Son’s seems to have the best conditions, and is also the busiest. But on the water it’s always manageable. 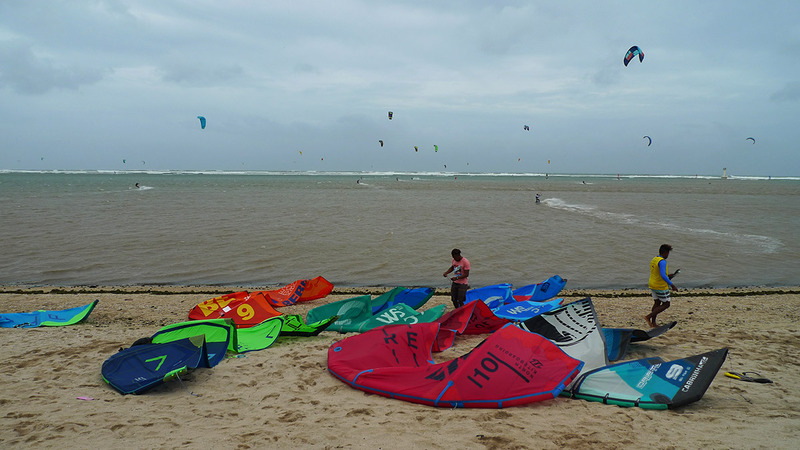 In total I counted around 60 kites in the lagoon and the waves on a busy day. Spread out on this wast area it’s not that hard to find a spot for yourself. IKO right of ways rules seem to be taken as recommendation rather than rule in this part of the world (not by the centres, but the Asian tourists) so just be vigilant, stay away from the learners and you’ll be fine. Bottom is sandy with dead coral scattered around. It’s being systematically picked up and dumped elsewhere so the lagoon is slowly getting safer. For now booties are recommended, especially if you’re still learning and need to walk around. Most people scrape their knees riding here. It’s just hard to avoid. Other than that the lagoon is almost void of obstacles, but there are two stone clusters marked by flags and a few plastic pipes that run from land to the reef. These are pinned down with stones and sticks and are not marked so need to be memorised when visible in low tide and avoided. Watch out for the rocks in the lagoon and get used to crashing flat on your back. Going big in the lagoon is fine as long as you know how to crash, should things go wrong. You have a few options here. 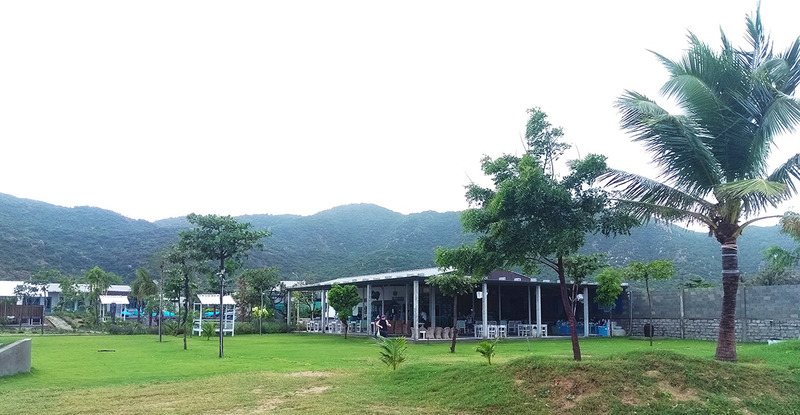 A lot of people stay in Phan Rang. It’s a fairly large city with lots of accommodation options. This requires a 25 minutes drive to the lagoon. For me, the better option is to stay at one of the kite centres or thereabout. 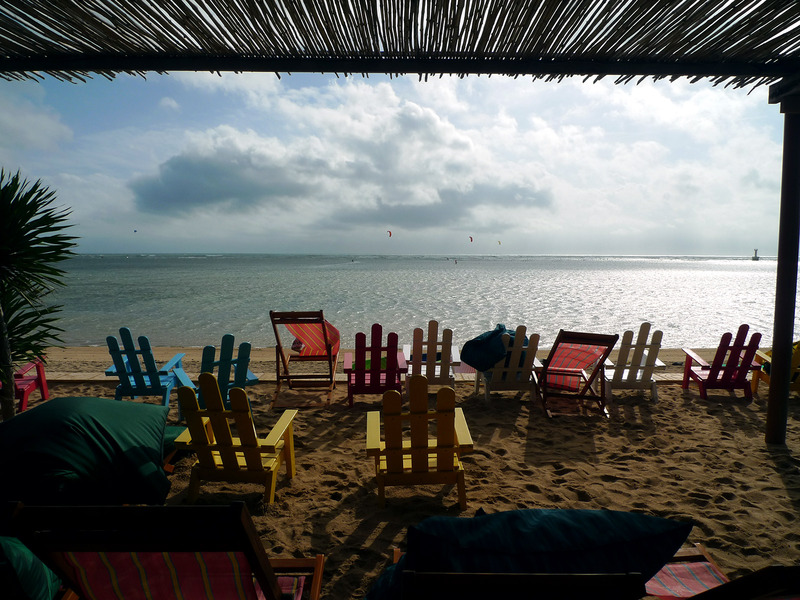 I was here to kitesurf so what’s better than waking up right at the spot? In modesty, a kite.sleep.reapeat lifestyle can be very invigourating. 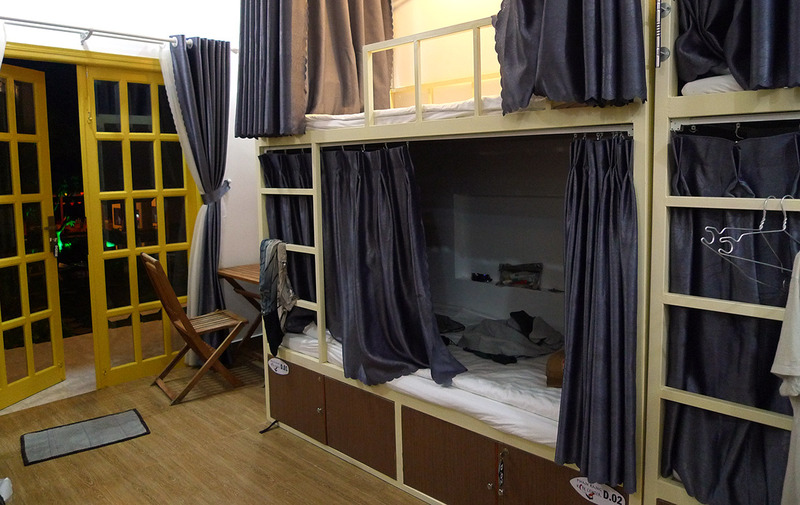 The dorm beds in Son’s place cost $20 a night and includes breakfast and all the centre facilities. There are also a few rooms available. There’s not much going on at night, but the restaurants at the centres do stay open for dinner. Expect no fibre optic speeds, but at least 2 – 6Mb WiFi, so good enough for a bit of working and streaming. 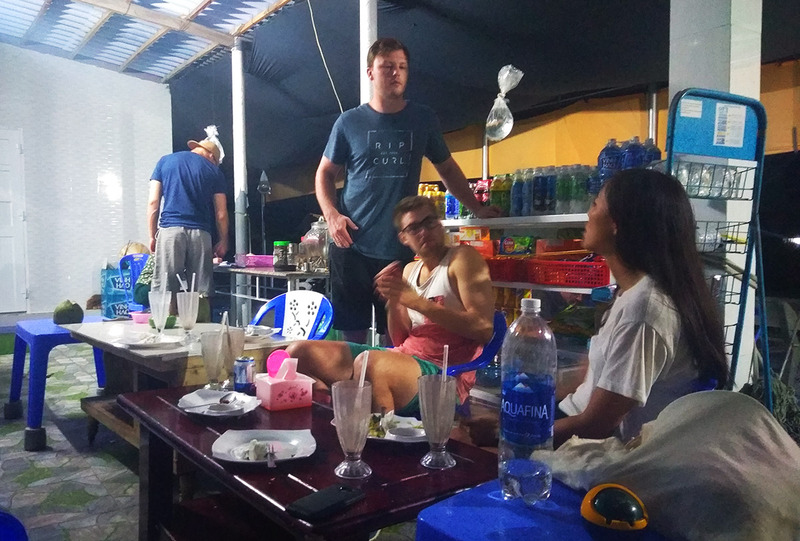 Enjoying dinner at Hoàng Sáng guesthouse. Evenings are quiet around the kite centers. 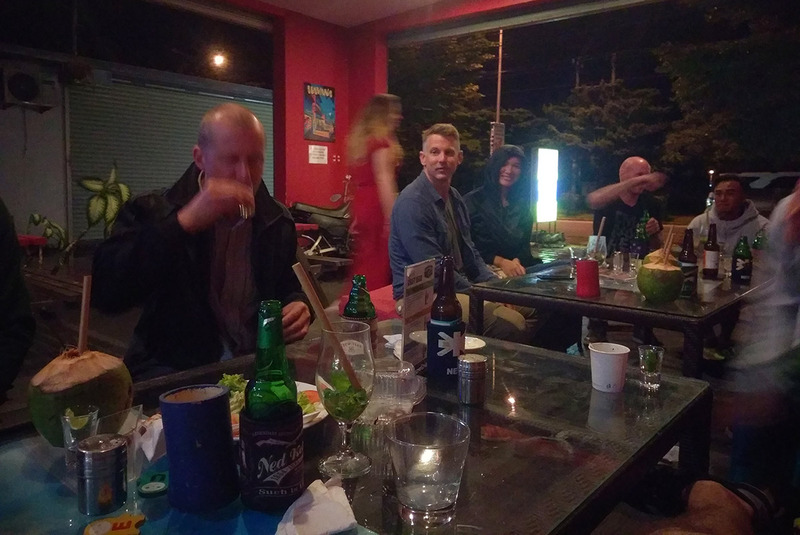 One can always head in to Phan Rang if feeling rowdy. This place rocks. 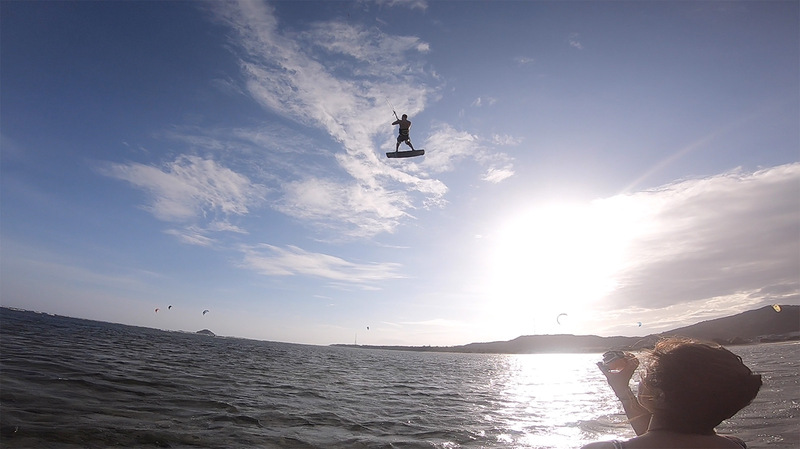 Windy, sunny, cheap and the spot is great for so many types of riding. I’m glad I got to experience the Phan Rang lagoon before it got mainstream. This place will explode in the next few years I’m sure. 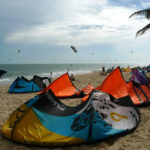 In my opinion it’s much better than Mui Ne which has always enjoyed a big following from the international kite scene, and as soon as the secret’s out they’ll be making their way up here instead. 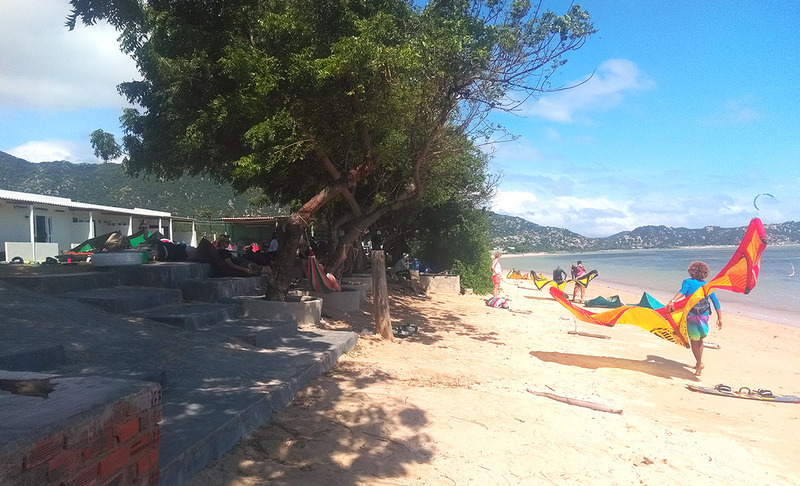 Especially now when the beach in Mui Ne seems to get smaller each year (this has been confirmed with VKS Mui Ne, who is now branching out with VKS Phan Rang. 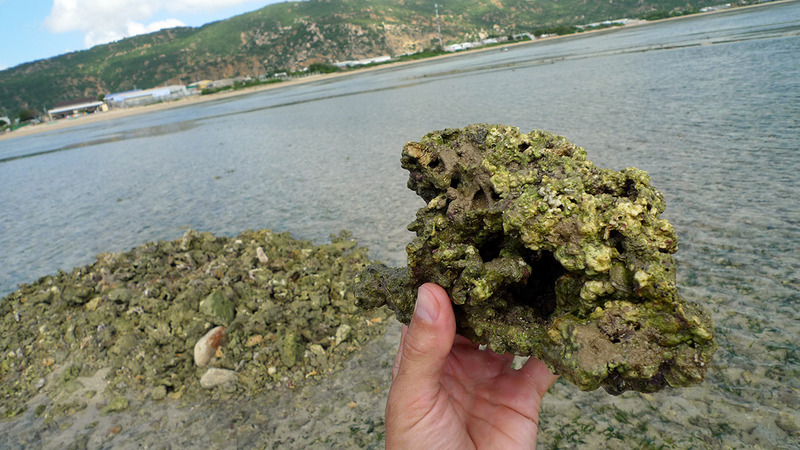 But here’s the kicker – not in My Hoa, but at another lagoon spot South of Phan Rang, apparently with even better conditions. Watch this space!). Until next time, My Hoa! I am in Phan Rang right now..What is the name of the other lagoon? And where is it exactly? Hey Bru. I’m not sure, but it could be just North of Son Hai. 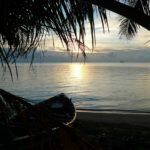 Get in touch with VKS in Mui Ne and they should be able to tell you.